Should Pluto's 5th Moon Make It a Planet? 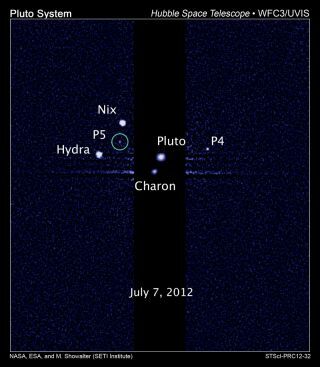 Scientists on Wednesday (July 11) announced the discovery of a fifth moon orbiting Pluto in a major solar system find. But while many people think of moons as accessories for planets, like the Earth's moon or Jupiter's many moons, Pluto doesn't quite make the cut in the International Astronomical Union's (IAU) definition of "planet." Despite of some determined lobbying by die-hard supporters to change its dwarf planet status, more moons around Pluto won't change its classification, experts say. "Does it change the planetary status? Of course not," Michael Brown, an astronomer at the California Institute of Technology, wrote to SPACE.com in an email. Brown's discovery of Eris, a rocky object about the size of Pluto, was a major factor in the IAU's decision to reassess exactly what constitutes a planet. The IAU ruled that to be called a planet, an object has to meet three conditions. It must orbit the sun without being another object's satellite, it must have enough gravity to make it sphere-shaped and it must clear the area around it of other objects. But even with Pluto's five moons, it doesn't "clear the neighborhood." Pluto isn't the only dwarf planet that has moons. The dwarf planets Eris and Quaoar have one, while Haumea has at least two. No one has found any other dwarf planet that has five moons, but that may be because scientists have studied Pluto more carefully than other dwarf planets, say both Brown and Alan Stern, a planetary scientist at the Southwest Research Institute in Boulder, Colo., and an advocate for classifying more objects as planets. This is the most detailed view to date of the entire surface of the dwarf planet Pluto, as constructed from multiple NASA Hubble Space Telescope photographs taken from 2002 to 2003. The center disk (180 degrees) has a mysterious bright spot that is unusually rich in carbon monoxide frost. The image was released in February 2010. See the dwarf planet turn in a video based on these images. "It might turn out that Kuiper Belt planets commonly have significant numbers of moons," Stern told SPACE.com. For Pluto, at least, the number of known moons may continue to grow in the near future. As scientists continue to scrutinize Pluto, looking for objects around it that may affect the New Horizons spacecraft that will arrive at Pluto in 2015, they may find even more moons. The scientists responsible for finding out everything they can about Pluto before New Horizons' arrival have found that Pluto's moons are arranged in concentric circles around the dwarf planet. They've found moons located in what they call positions 1, 3, 4, 5 and 6. "It makes you wonder if there's something at location 2 and locations 7, 8 and 9," said Mark Showalter, a planetary astronomer at the SETI Institute in Mountain View, Calif., who led the team that discovered Pluto's new moon.